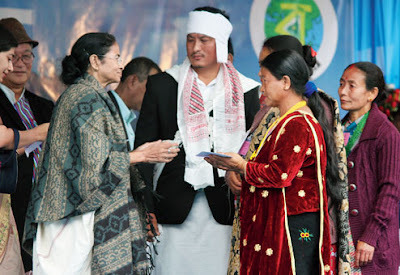 Mamata Banerjee today tossed a trump card that could checkmate the Gorkha Janmukti Morcha by announcing that the state government would conduct a survey on granting land rights to the residents of a tea garden in Mirik municipal area. Around 70 per cent of the nearly 8.75 lakh hill people live in tea gardens and cinchona plantations and don't have right to the plots where their families have been living for generations. However, the chief minister today just spoke about the survey for people without land rights in six-seven wards of Mirik municipality. "We will conduct a survey to address the land problem that you have in Mirik town. The survey is needed as we will have to get a clear picture, find out who has what, a shop or a residential house. After the survey, we will take an official decision so that you get an address of your own. We will find out a solution to your problem," Mamata said, drawing a huge applause from a gathering that came here to witness her declaration of Mirik as a new subdivision. M.K. Zimba, who was previously the vice-chairman of the Morcha-controlled Mirik municipality but had joined Trinamul recently, today said: "The municipality has a population of about 12,000 today but most of the people here do not have land rights. Only those residing in wards 4 and 5 have land rights along with about 25 percent population of ward 3. This is a major announcement from the chief minister." The land right demand has always been raised by the Morcha and Harka Bahadur Chhetri's Jana Andolan Party. The Morcha had formed a 115-member committee to pursue the demand, but has been inactive of late. Told about Mamata's announcement, the Morcha general secretary Roshan Giri said: "She has made the announcement keeping elections in mind. She is only indulging in politics. We, however, demand that the entire population spread across the hills be given land rights." Observers believe Mamata's one announcement on land rights could pose fresh problem for the Morcha as Trinamul will now take this message to tea garden dwellers. The announcement could also put the Morcha in a tight spot in the coming municipal polls in Mirik. "There is every reason for the Morcha to be worried now. If the state government initiates the process now, the political fortunes of Trinamul could swing positively across the hills," said an observer. A former bureaucrat in the hills, however, sounded cautious. "Granting land rights to residents of seven wards in Mirik town might not be a problem. However, it would be a huge task to replicate the same across all tea gardens and cinchona plantations in the hills. We are not sure how the management of respective tea gardens would react to such a move," said the retired officer. The cinchona plantation is under the GTA now.